The new byte code weaver, initially released with OTDT 2.3, has matured to the point where it is considered production-ready in 2.5. It supports runtime weaving, i.e., the option to weave and activate roles and teams that are not known during application launch. It is fully capable of handling Java 8 byte code. This is a side-effect of using the byte code library ASM (as opposed to the BCEL-based implementation of OTRE). Maturity of the new weaver is witnessed by the fact that OTDT 2.5 in fact runs on this new runtime. Both weavers are supported by the compiler by generating specific infrastructure to be invoked from woven code. Due to the fundamental difference in weaving schemes, it is necessary to selected at compile time, which weaver should be targeted. Please see the section on target weaving schemes in the developers' guide. Completely disable weaving into subtypes of Thread and Runnable. Weave only into those subtypes of Thread and Runnable that reside in a plug-in that is also affected by an aspectBinding (OT/Equinox only). Enable normal weaving into subtypes of Thread and Runnable. Under OTDRE, every class in the system should be seen as the potential base class of some role to be loaded at runtime. It may be desirable to restrict this to specified "weavable code regions". Possible reasons include performance and protection (of sensitive code regions, e.g.). It is now possible to define such "weavable code regions" by providing a simple text file. Each line in this file will be interpreted as a prefix of class names (no support for wildcards at this point). A class whose fully qualified name matches one of these prefixes is weavable, all others cannot be woven into. The text file is announced to the runtime by providing its path in the file system as the value to the system property ot.weavable. When installing OT/Equinox (i.e., the plug-in org.eclipse.objectteams.otequinox), the new weaver OTDRE is by default selected in eclipse.ini. 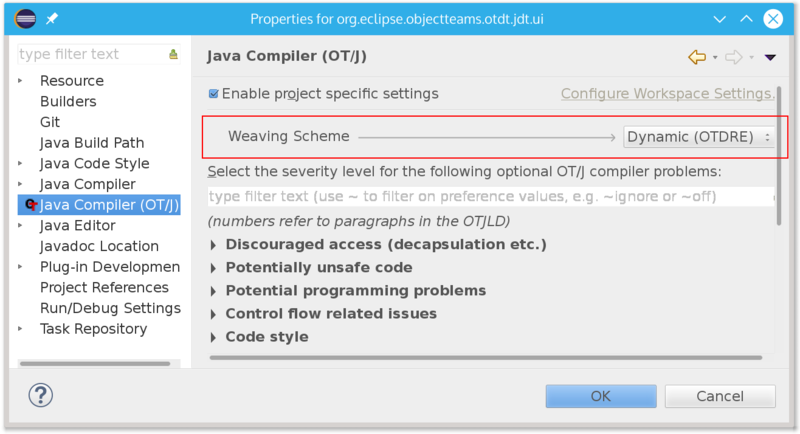 When launching an OT/Equinox-enabled application, the correct weaving scheme is now automatically selected by inspecting any OT/J projects involved in the launch. It is not necessary to explicitly pass any Object Teams specific arguments. For plain OT/J applications this was solved already in OTDT 2.3.